Ultrasonic Sensors and Blanking Distance - SILVER AUTOMATION INSTRUMENTS LTD.
An ultrasonic level sensor is mounted on a large tank. Ultrasonic sensors are a little farsighted. By nature of the technology, most do not measure surfaces that are within a few inches of the transducer face. This is known as a blanking distance. So what is a blanking distance, and why does it exist? In order to understand this fully, it is important to grasp that there are two keys to how ultrasonic sensors work: vibration, and time. Operationally, ultrasonic sensors produce and detect vibrations. They pulse to produce sound – much like a speaker – and they listen for the returning sound. When the sound wave does return, it produces a small vibration on the face of the sensor. It is this second vibration that the sensor associates with the target surface. The time the sensor waits for the return vibration is used to calculate distance. 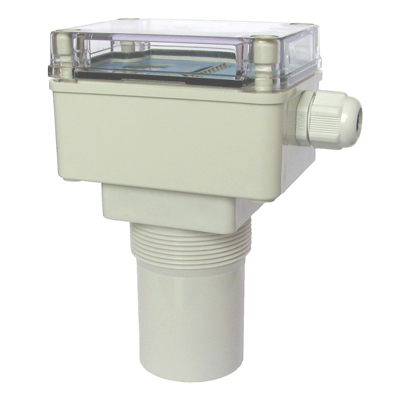 The sensor can then determine tank levels, volumes, flow rate, and more depending on the model and the features. An ultrasonic sensor equates time with distance. Because the sensor uses the same transducer to both produce and listen for the sound wave, it can become confused without a little logic. When the transducer first pulses, it naturally causes residual vibration for a split second. The sensor must be programmed to ignore signals for as long as it takes the residual vibration to stop. This programmed time equals a certain distance. Therefore, the waiting period is called a blanking distance. Without a programmed blanking distance, the ultrasonic sensor would immediately signal a false surface right up against the transducer face. The blanking distance is part of the logic of the sensor, and is how it distinguishes between pulse vibrations and return vibrations. The length of the blanking distance is tied directly to the frequency of the transducer and the power of the pulse. A small, low-range transducer will produce a smaller pulse that will not vibrate as long. Therefore, smaller ultrasonic sensors enjoy shorter blanking distances, as little as 4 inches. Large ultrasonics can have blanking distances as long as 1½ feet or more. For some, blanking distances are a bit of a pain. They want to be able to measure right up to the transducer face. This is not easy, but they can certainly mount their ultrasonic sensor a bit higher with little effort. We’ll get into this a bit more when we cover ultrasonic mounting techniques and stand pipes. There are some advantages to having a blanking distance, especially a programmable one. Increasing the length of the blanking distance can block out unwanted return signals from obstacles, such as a ladder in a tank. Again, we'll talk more about programming blanking distances a little later.